It's the middle of December and we're all gearing up for holiday gatherings. 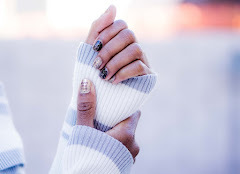 Maybe you're going to an office holiday party, a feast with friends or spending time with your out-of-town relatives. Whatever the event, you simply can't show up empty handed. 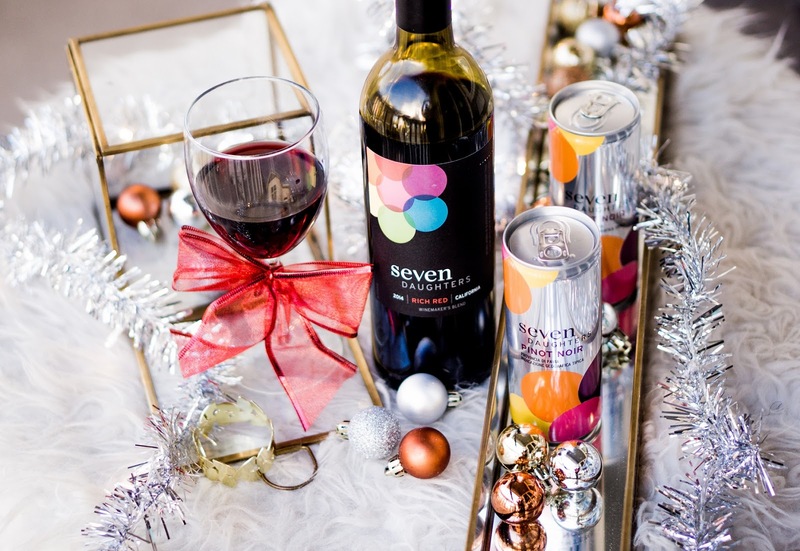 Aside from the latest electronic or fashion trend, there's one other thing that you can bring to a holiday party that I'm sure everyone will love: Seven Daughters wine! Last month I spent Thanksgiving with the in-laws in Boston. They hosted almost 20 people with a bevy of appetizers, desserts and three different types of stuffing. Of course, we had our choice of drinks, but we didn't appropriately prepare for how fast the alcohol would go with so many guests. So we decided that we would make a drink run to pick up a couple of bottles of wine and the like. Unfortunately, this was on Thanksgiving day. Since it was a holiday, most stores were closed and the only place that was open was a nearby gas station. When we went to the gas station, we saw that it sold wine, so we assumed we had lucked out. And then we learned something very interesting: stores are not allowed to sell alcohol on Thanksgiving in the state of Massachusetts. But now I know better! 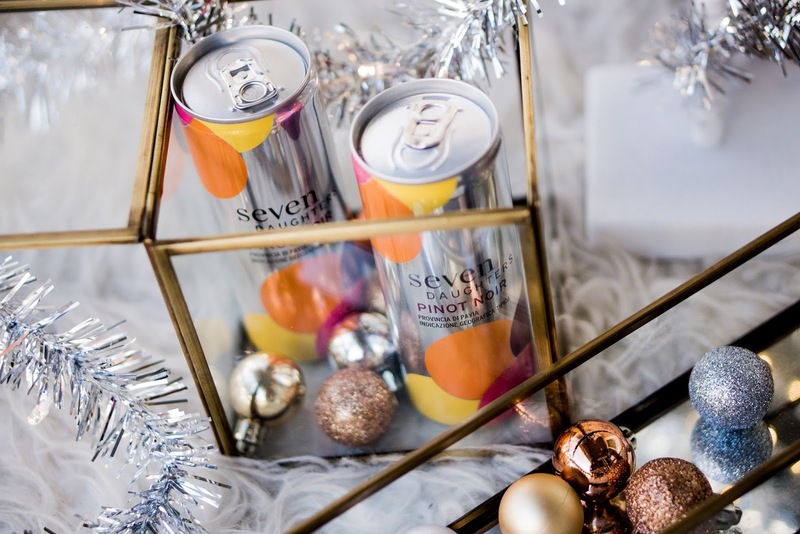 When it comes to holiday parties this December, I'm definitely bringing my cans and bottles of Seven Daughters wine. And here are seven reasons why you should, too! Can't Cook? Supply the Wine! Not much of a cook? Neither am I! If you're not good in the kitchen, then I'd recommend supplying the wine. 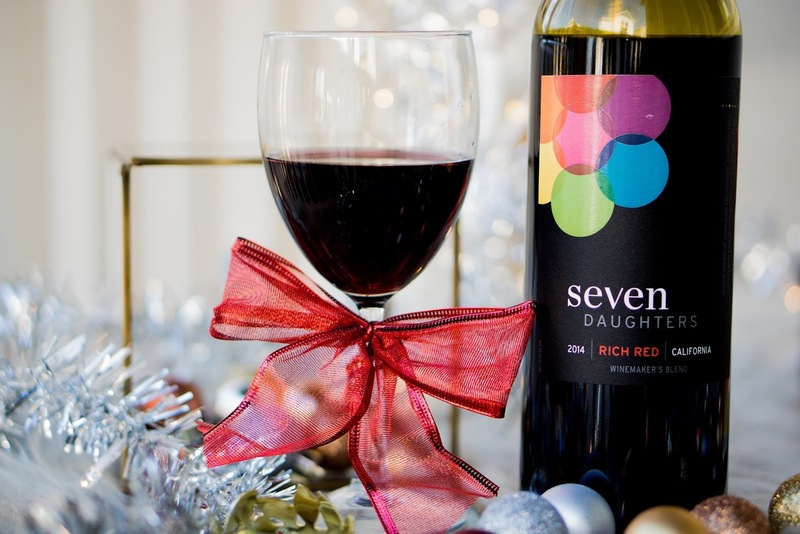 The Seven Daughters Rich Red is a winemaker's blend that's made from seven grape varieties for a smooth, well-rounded flavor. All my red wine drinkers went ga-ga over this blend when they tried it at my house a couple months ago. If you're bringing the wine as a holiday gift, then you should keep in mind that a bottle of the Rich Red pairs well with red sauce pasta, grilled poultry and beef dishes. The Pinot Noir cans go great with grilled chicken and mac and cheese. 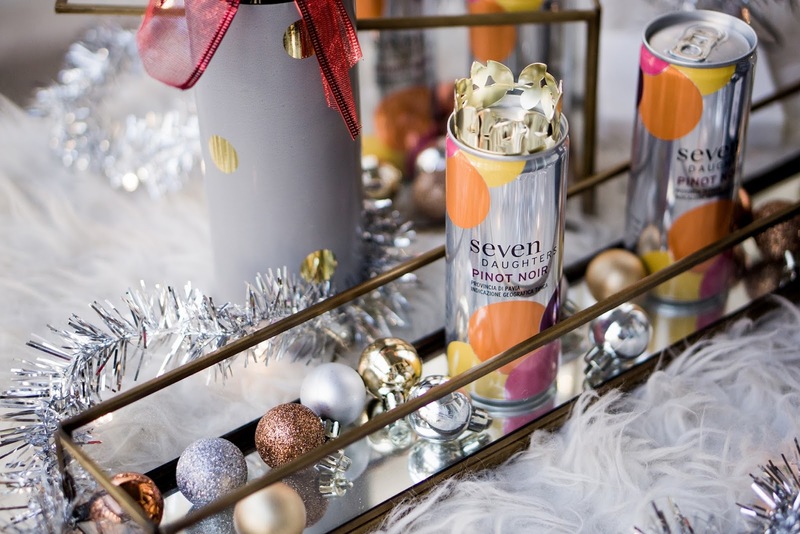 Make stocking stuffers fun this holiday season by filling them with cans of Seven Daughters Pinot Noir. Each can is smooth, fruity and full of bright cherry and raspberry flavors. 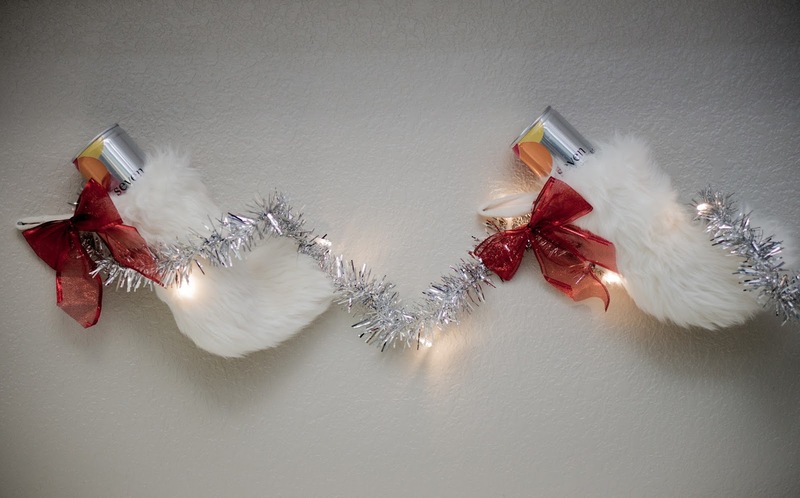 Each can is 250ml so they fit perfectly in a stocking! When you bring a few bottles of the Rich Red blend to a holiday party, they can actually serve more than one purpose. After everyone at the party tops off the wine (and they will because it's so delicious), you can then use the bottles as beautiful holiday centerpieces. 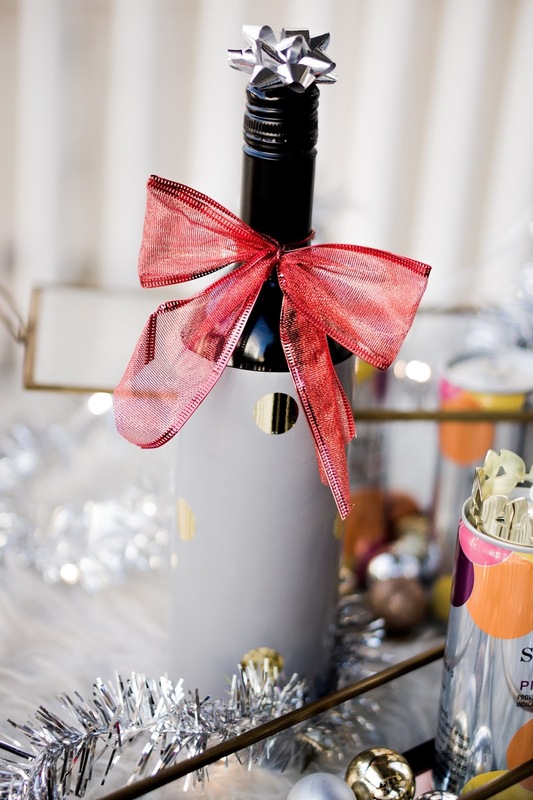 As a fun event, each person at the party can use some wrapping paper, holiday bows and lights to create a Pinterest-worthy bottle cover. Fill the empty bottles with a few blossom branches for a nice touch. During the holidays, a lot of offices like to do Secret Santa gift exchanges. Usually, the gifts selected aren't always the most wanted. 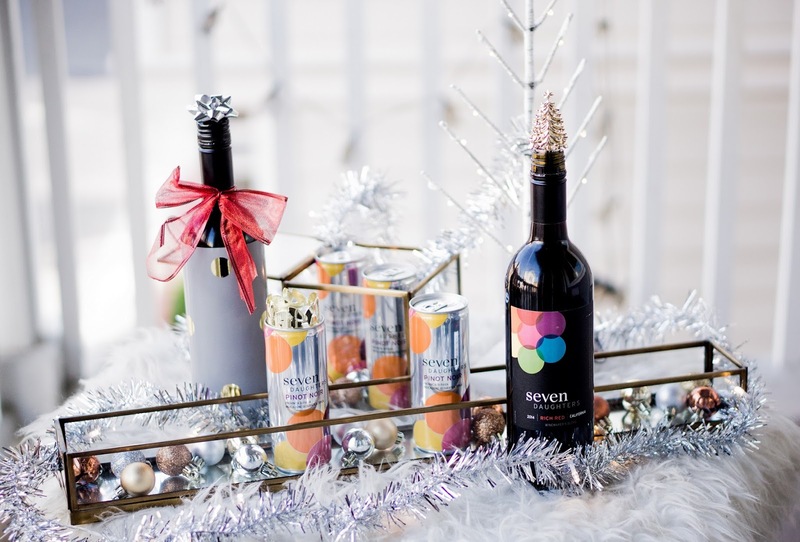 This year, get a little fancy with your Secret Santa gift with the help of the Pinot Noir cans or Rich Red bottles of wine. Since the four-pack cans sell for under $14 and a bottle goes for $15, you can get one of each and still meet the acceptable price limit for a typical Secret Santa gift exchange. Not sure where to get your Seven Daughters wine? Head over to Target, BevMo or Whole Foods. And if you have time to shop online, then find the wine at Uncorked.com. 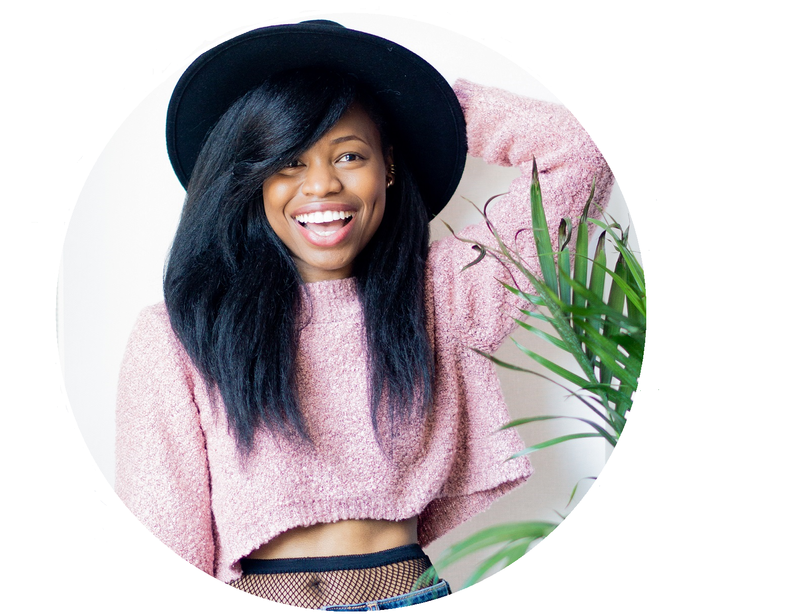 With my MUSE7D code, you can save 20% on your order! 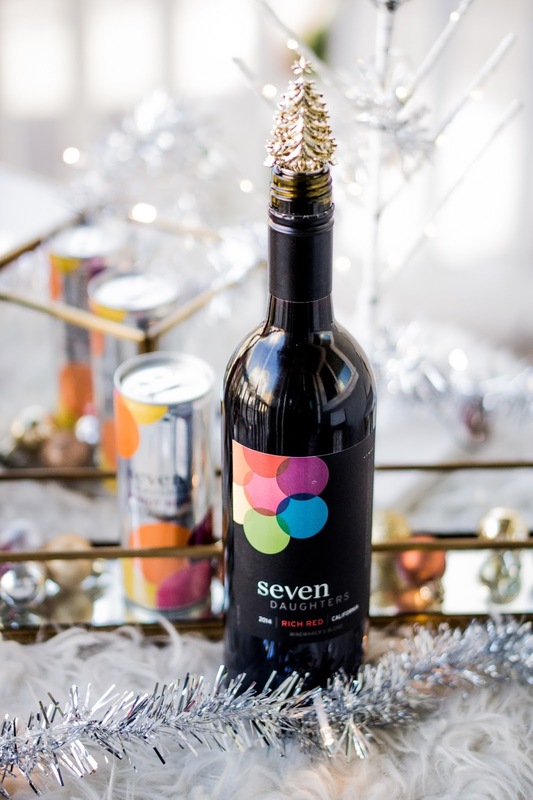 Another great aspect of Seven Daughters wine is you can bring the Rich Red blend to a holiday gathering and create a festive mulled cocktail. All you need is a combination of oranges, cloves, cinnamon sticks, star anise, honey and the Rich Red blend for a drink that all party-goers can snuggle up with while sitting across a warm fire. So your family, your best friend and your coworker are all having holiday parties on the same day this year? No worries! 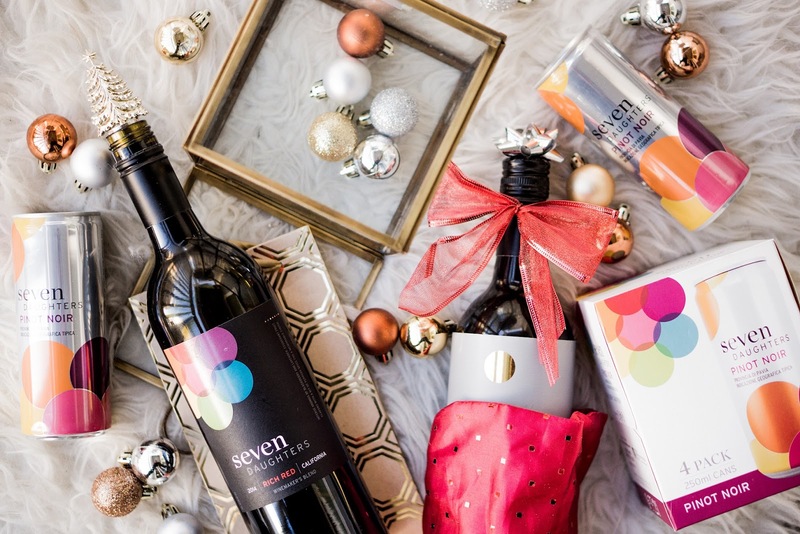 Seven Daughters wine is meant to be enjoyed on the go, so pack them up and take them with you as you holiday party hop this December! The Pinot Noir cans come in 4-pack boxes, which makes them portable. Although I'm mainly focusing on the Rich Red and the Pinot Noir, Seven Daughters has a variety of varietals to choose from. If you have a few discerning sommeliers in your family, then you can probably find a wine for each person. You might have a sister who wants a rosé, an uncle who loves a good red blend, and a mom that likes to pair her eggnog cheesecake with a glass of moscato. With Seven Daughters, you simply can't go wrong this holiday! This post was sponsored by Seven Daughters. All opinions are my own. 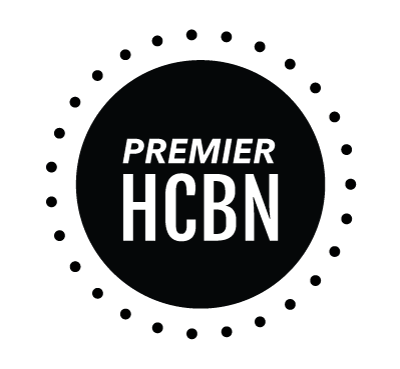 I'll have to check out this brand, I haven't heard of it before. Wine is the classic go-to hostess gift!! I always bring wine to any holiday party I attend! I'm definitely not the cook so it's easy to bring a few bottles to enjoy! I could not agree more! Wine is the best thing for parties! Great post girl. This looks a like a goodie! My hubs just got back from Australia and came home withe a few lovely reds! Wine is the BEST gift ever! I don't think I'd ever complain if that's the only gift I ever got! I love a good bottle of wine!! You cannot beat bringing a good bottle of wine to get the party started! I agree! Wine is always a great gift! I love the cans! Such a cute surprise in your stocking! Such a great gift idea for the hostess! Love this post Seven Daughters has SUCH cute packaging...besides, who doesn't love wine??? Wine definitely makes for an awesome secret santa gift. I did this for our work soiree last week. Bringing wine is better than presents! Lol it's pretty much number one my Christmas list!